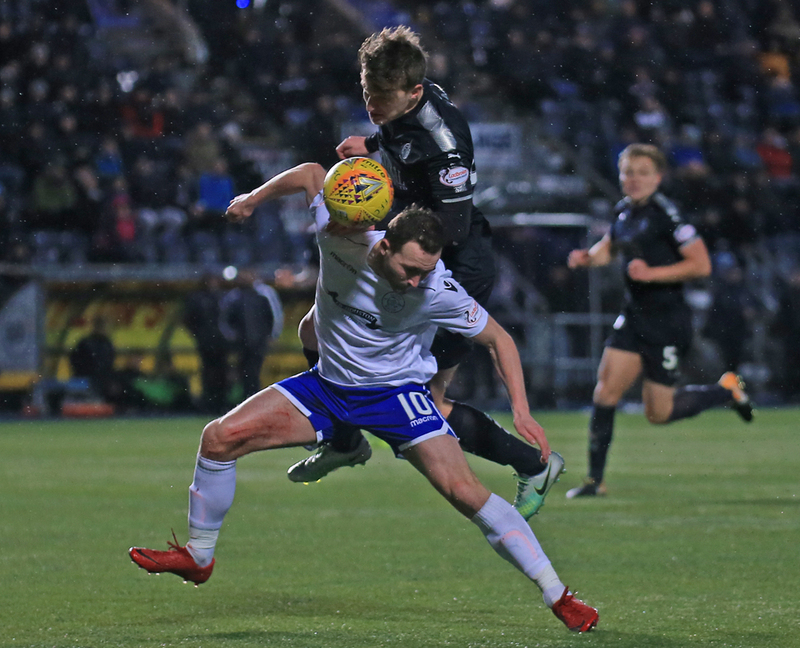 The Doonhamers ended 2017 in a disappointing fashion with a 3-2 defeat away to Falkirk. First half goals from Peter Grant, Myles Hyppolyte and Louis Longridge gave the hosts a three goal advantage, before Stephen Dobbie and Jason Kerr netted for the visitors. Manager Gary Naysmith was forced to make two changes to the team who narrowly lost to Championship leaders St Mirren. Shaun Rooney and Callum Tapping came in for injured duo Kyle Jacobs and Jordan Marshall. The returning Joe Thomson, who signed on loan this week from Celtic, was named on the bench with the likes of James McFadden and Derek Lyle. 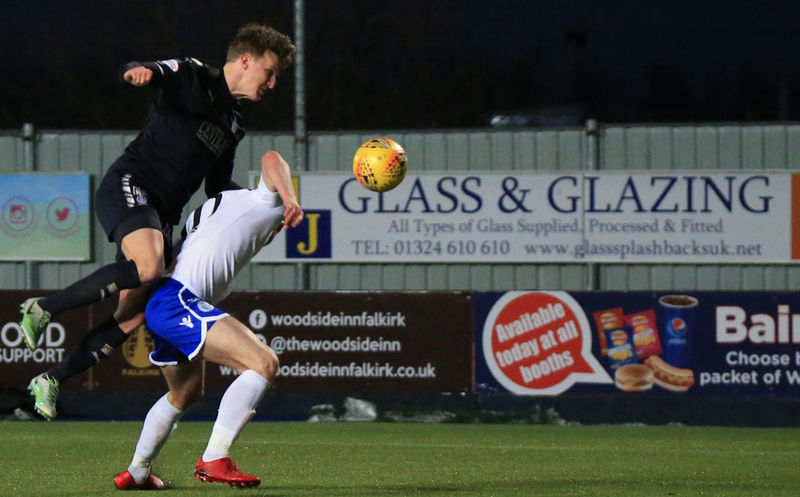 Ex-Queens right back Lewis Kidd started for Paul Hartley`s side with former keeper Robbie Thomson and winger Alex Harris on the bench for the Bairns. The hosts who are in danger of a relegation play-off battle this season came into the match on the back of two consecutive goalless stalemates. Queens created the first chance of the contest when Chris Kane was fouled by Tom Taiwo in the middle of the pitch. It was a foul that the midfielder could`ve seen a card. The free-kick was driven into the box and was headed to the path of Andrew Stirling. The winger took a touch to beat his marker and from the edge of the box fired his effort over the bar. Lyndon Dykes was next to try and find the opener on 10 minutes but his shot went wide of the post. Immediately from that chance Hartley`s men broke up the park and won the first corner. Playmaker Craig Sibbald swung in on top of Queens goalkeeper Alan Martin who tipped over the bar. Sibbald then had an effort at goal following a free-flowing move blocked, before heading Longridge?s cross towards goal which was deflected past the far post. 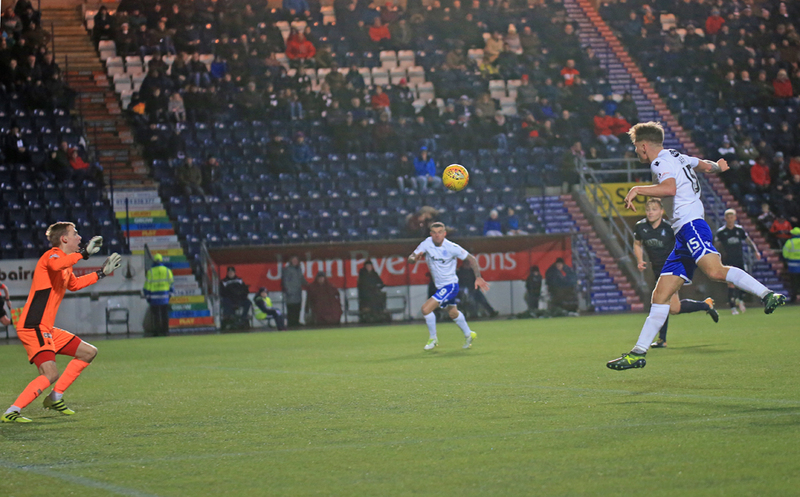 Queens captain John Rankin chipped a sublime delivery into the box and was headed backwards by Aaron Muirhead. This went into the path of Dobbie who cut inside but his low effort hit the side netting on 18 minutes. The Bairns took the lead just two minutes later from a corner kick. Defender Peter Grant met Louis Longridge?s corner from the right to hammer an effort into the top corner. From then the hosts were well on top and Queens had to thank the woodwork they weren`t further behind when Hyppolyte`s cross was nearly turned into the net by Scott Mercer but thankfully hit the post and he cleared the ball to safety. The ex-Livingston winger caused the Doonhamers problems throughout the half. He had a deflected effort held by Martin, before forcing the goalkeeper into an impressive stop to deny a stunning drive from distance. But Hyppolyte wasn`t to be denied for much longer as he turned in a Sibbald knockdown from close range to double Bairns` advantage on 42 minutes. Only two minutes later Falkirk got their third and it looked as if the contest was dead and buried. Forward Longridfge took hold of the ball on the left wing, before he cut inside and powered up a terrific strike which flew into the bottom corner which left Martin no chance. 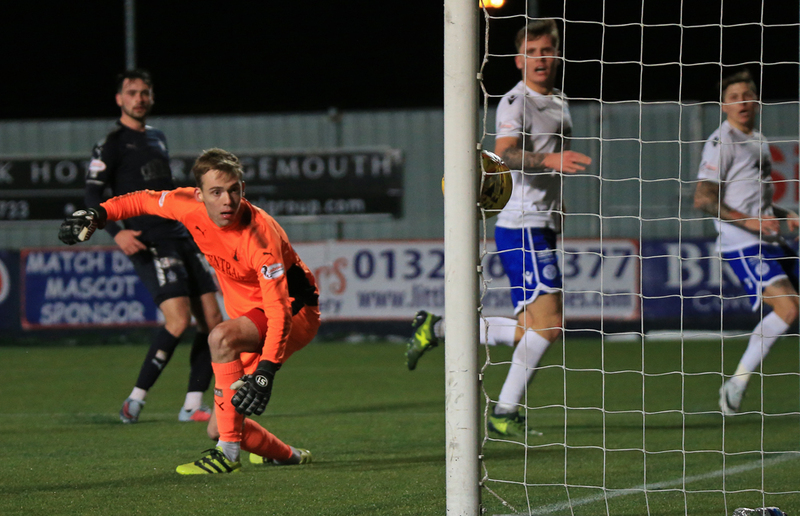 Queens ended the half in a positive fashion when Dobbie curled a superb free-kick from 20-yards into the bottom corner. Was it game on at The Falkirk Stadium perhaps? The hosts suffered a blow at the start of the second half as Hippolyte remained down following a clash, before eventually being stretchered off. He received a warm standing ovation as he left the field and was replaced by former Queens winger Alex Harris. It didn?t take long for ex-Hibernian man to get involved as he angled a powerful strike just wide of the upright. Falkirk keeper Robbie Mutch made a great block to deny a goalbound strike from Dobbie on 61 minutes. 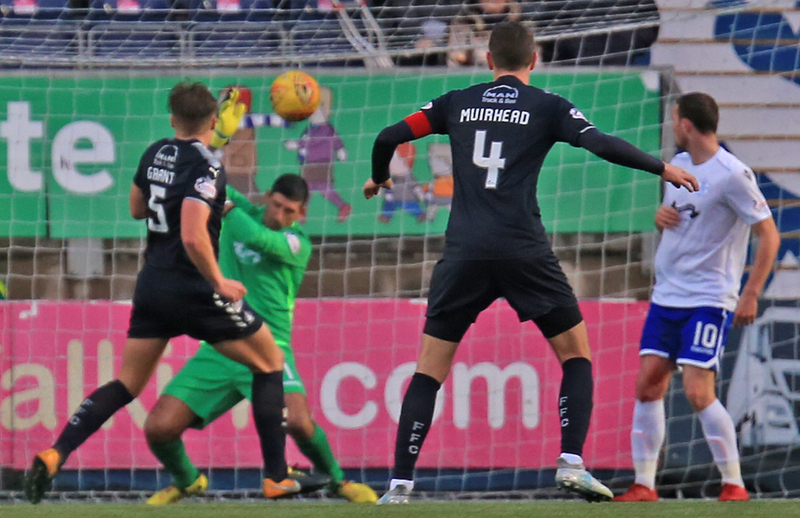 The 208 Doonhamers at the Falkirk Stadium claimed for a penalty kick when Kane was barged down in the box but referee Alan Newlands pointed for a corner kick instead. 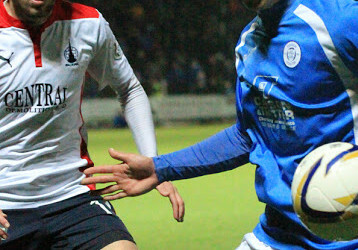 Joe Thomson replaced Callum Tapping to mark his first appearance of his second stint for the Doonhamers. With 20 minutes remaining Kane did extremely well to beat his man on the right and his cross was met by Dobbie who backflicked it just wide of the post. With the visitors pushing forward they left gaps in defence and were lucky not to be further behind when Harris ballooned over his chance from 13 yards. 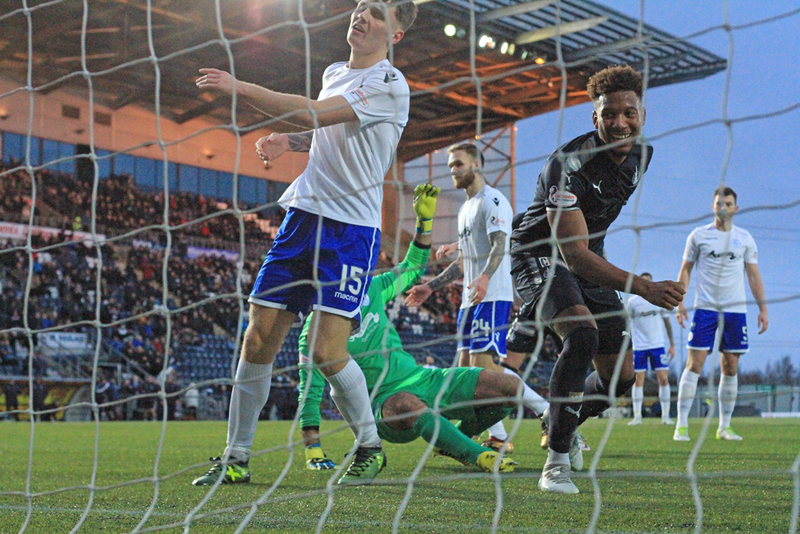 Queens finally did get their reward for the constant late pressure when Jason Kerr headed in off the post but couldn`t get that all-important third goal to claim a point. 14:33 Two changes for Queens this afternoon. Shaun Rooney and Callum Tapping come in for injured pair Jordan Marshall and Kyle Jacobs. 14:35 Joe Thomson is on the bench today following his return to the club this week. 15:01 The teams are out and we`re only moments from kick-off. 3 min Rooney bursts forward but he fouls a defender. Still 0-0. 4 min Nice movement on the right between Dykes, Kane and Mercer but the assistant has his flag up.0-0. 5 min Taiwo fouls Kane in the middle of the park. Very lucky to not see a card there. 0-0. 6 min The free-kick is driven into the box the ball is headed to the path of Stirling who takes a touch but then fires over the bar. 8 min Sibbald`s corner is parried over by Martin for another set piece. 10 min Mercer`s ball in is collected by Mutch. Still 0-0 here. 15 min A great ball into the box is met by Dykes but his effort goes wide. Falkirk break up the park and win a corner. 19 min Falkirk break forward with a great move but Dykes clears for a corner. 20 min Grant powers in from the corner to give the hosts the lead. 30 min Great through ball finds Kane but before he can pul the trigger Muirhead tackles for a corner. 31 min Kane fires over the bar from long range. 33 min Hippolyte`s cross is nearly turned into the net by Mercer but he hits the post. A major let-off for Queens. 37 min McGhee`s effort from the edge of the box goes over the bar. 38 min Hippolyte`s shot is saved by Martin. 40 min Hippolyte`s long range shot is parried by Martin. 41 min Getting a wee bit heated here as Dykes fouls. 43 min Bairns extend their advantage just before the half time whistle. 45 min A great strike from Longridge. 45+2 min Dobbie curls a superb free-kick into the bottom corner. Game on perhaps? 50 min Delay in play here as Hippolyte will be stretchered off. 52 min Dobbie`s shot is deflected out for a corner. 53 min Dykes` shot is blocked for a corner. 53 min Stirling balloons his effort over the bar. 58 min Stirling`s cross is hit out for a corner. 59 min Dobbie`s shot from the edge of the box is saved by the keeper. 61 min Kane claims for a penalty kick after he is barged down in the box but the referee points for a corner kick instead. 63 min Joe Thomson is about to come on for the Doonhamers. 70 min Kane does well to beat his man on the right his cross is met by Dobbie who backflicks it just wide. 86 min Harris blows over a great chance for the hosts. 90+1 min Great move from Queens and kerr heads in off the post.